The EcoSEC High Temperature GPC System and earlier Tosoh GPC models feature dual flow RI detection for enhanced baseline stability, unaffected by significant changes in temperature and atmospheric pressure. Refractive Index detectors measure the difference in refractive index between a sample and a reference cell. Most RI detectors are of the single flow type, in which the reference cell is statically filled with solvent rather than the solvent flowing through the cell, as in the dual flow design. In a single flow design, the properties of the solvent in the reference cell slowly change over time. Since the solvent flows through the reference cell in a dual flow RI detector, the changes over time become insignificant. Advanced engineering, along with complete temperature control and a dual flow RI detector, means rock steady baselines in even the most challenging solvents and temperatures. The RI baselines as obtained for three commonly used high temperature GPC solvents: Trichlorobenzene (TCB) at 145 °C, orthodichlorobenzene (ODCB) at 145 °C and 1-chloronaphthalene (1-CN) at 210 °C are shown in the figure below. The RI baseline drift for all three solvents is less than 1 mV/h. 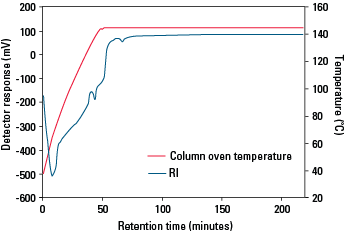 The unmatched baseline stability of the dual flow RI detector in the EcoSEC High Temperature GPC System is also shown in the following table through the drift, fluctuation, and noise obtained when ODCB at 145 °C, TCB at 145 °C, 1-CN at 210 °C, and THF at 40 °C are used as the mobile phase. On the EcoSEC High Temperature GPC System, the RI baseline is considered stabilized when the drift in the signal is 3.0 × 10-7 RIU/h or less. When a new set of columns is manually placed on the EcoSEC High Temperature GPC System and the flow rate and temperature controls are started, the RI baseline stabilizes after three hours. 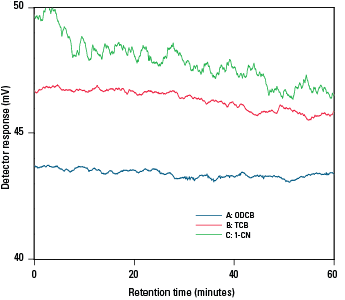 The following figure demonstrates the equilibration time from start-up of the EcoSEC High Temperature GPC System in ODCB.